“In those days, when again a great crowd had gathered, and they had nothing to eat, he called his disciples to him and said to them, “I have compassion on the crowd, because they have been with me now three days, and have nothing to eat; and if I sent them away hungry to their homes, they will faint on the way…” (Mark 8:1–3). The passage above tells us about Jesus preparing to feed four thousand people beside the sea. It follows along nicely after our devotion for yesterday when we considered the Body and Blood of our Lord which is offered to us each and every Sunday. While the miracle of the Feeding of the Four Thousand makes use of loaves and fish to feed the people, the account is still a foretelling of what was to come when Jesus would institute the Lord’s Supper. In the four Gospels, every story of feeding was understood as telling us something about the Lord’s Supper which was to come. The early Christians heard these accounts and immediately looked for connections between meals and feeding and what Jesus was instructing them about His Holy Supper. In this passage, we see that Jesus feeds people because He has compassion on them, hungry, tired, needing food for the journey. 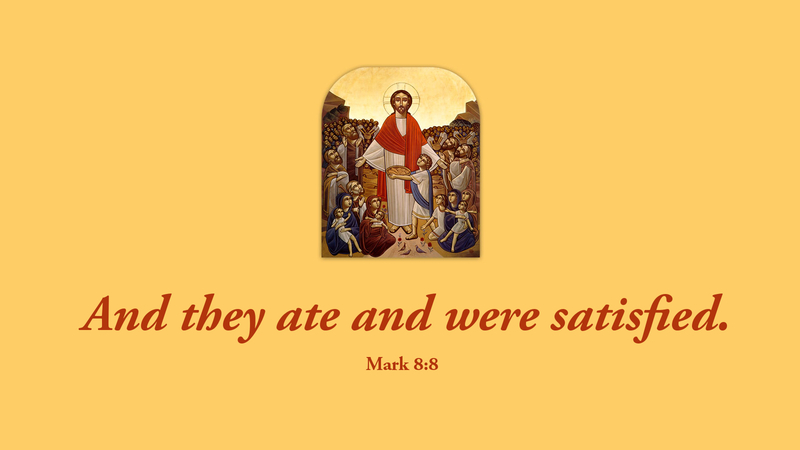 And then, after all had eaten, the disciples collected the leftovers–and it was seven baskets full! You see, this miraculous feeding intends to point us forward to the Lord’s Supper which Jesus offers to those who are hungry, tired, and needing spiritual food for our journey through life. He has compassion on us as we find ourselves exhausted and unable to continue on without spiritual nourishment. And just as the disciples were worried about having enough food for all, the fact that there were seven baskets left over is a sign—seven being the number of divine completeness. It assures us that there will be enough for all in the Church when we come together for the Lord’s Supper. All will be fed and there will still be more for those who will come in the future! There will never be a shortage of the Lord’s Body and Blood, but all may come and receive the real presence of Jesus Christ! Prayer: Lord God, thank you for the Bread of Life, Jesus Christ our Lord, who feeds us with His very presence; through the same, Jesus Christ. Amen.